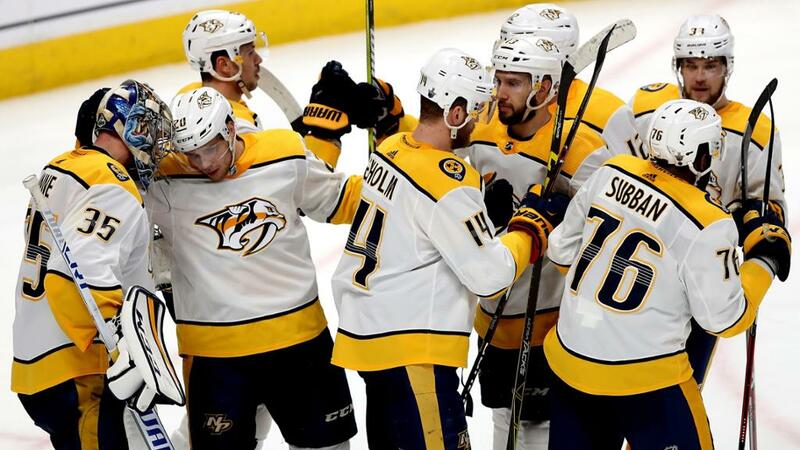 The Predators finally flashed the consistent 60-minute form that made them the NHL’s dominant regular season team in Game 6 Sunday night against the Colorado Avalanche. By eliminating them 5-0 the Predators avoided a Game 7 back in Nashville, and earned a couple of days rest. Now they and their second round opponent the Winnipeg Jets wait until all the other first round series are completed before the Stanley Cup Playoffs move into the next phase. It is quite possible that this will be the toughest opponent the Predators face in their bid to once again play for the Stanley Cup. The Jets finished second in the Western Conference to the Predators. Nashville barely won the season series 3-2, and none of the games were decided by more than two goals. Winnipeg took the finale 5-4 in a shootout, but all five were hard fought, wide open and tightly contested. There are those who think that the Jets’ goalie Connor Hellebuyck is every bit as good as Pekka Rinne. The Predators have the top defensive corps in the NHL, with Norris Trophy finalist P.K. Subban as the featured attraction. But the Jets have one of the league’s biggest defensive players in Dustin Byfuglien, formerly a member of Cup-winning Blackhawks’ teams, at six five, 260 pounds. Their forwards are among the finest in either conference, anchored by Patrik Laine. The Predators know that a couple of things they did against the Avalanche will get them beat in this series. For one, they can’t repeatedly get down as they did in the opening two games. Nor do they want to let leads slip away as they did in Game 5. In addition, they don’t want to let penalties mount up and give the Jets multiple power plays. On the positive side, for most of Game 5 and all of Game 6 Pekka Rinne looked like the Vezina Trophy finalist he is, and goaltending will be paramount in this series, as well as offensive and defensive consistency. While there are many unhappy the two best teams in the Western Conference are meeting in round two rather than the Conference Finals, that’s the way the bracket’s been set up the past four years. The series begins later this week after the conclusion of the other first-round series.